A nuTonomy self-driving taxi drove along a road in its public trial in Singapore. The tiny Cambridge startup nuTonomy Inc. Thursday outflanked Uber Technologies Inc. with the launch of the first self-driving car service, used in taxis in Singapore. NuTonomy is providing the control software guiding the six taxicabs that debuted in Singapore, modified electric cars from French automaker Renault and Japan’s Mitsubishi. Each vehicle uses lasers and cameras to observe its surroundings and steer through Singapore's business district. An engineer from nuTonomy was in the front seat, ready to take control if necessary, and a researcher in the rear monitored the cars’ computers. The taxi experiment was limited to a 2.5-square-mile section of Singapore, and the riders were selected from among Singapore citizens who had signed up in advance; Iagnemma said about 10 customers received the free rides Thursday. “We’ve been overwhelmed with many applications to participate in the pilot,” Iagnemma said. One of the riders Thursday was Olivia Seow, 25, who works in the startup industry in the Singapore district where the experiment was conducted. She acknowledged she was nervous when she got into the car, and then surprised as she watched the steering wheel turn by itself. ‘‘It felt like there was a ghost or something,’’ Seow said. But the ride turned out to be smooth and controlled, she said, and Seow was relieved to see that the car recognized even small obstacles like birds and motorcycles parked in the distance. ‘‘I couldn’t see them with my human eye, but the car could, so I knew that I could trust the car,’’ she said. NuTonomy was the first company to win approval from Singapore's government to test self-driving cars. The corporate investment arm of the Singapore Economic Development Board was also involved in a $16 million fund-raising round that nuTonomy announced earlier this year. Other investors include Cambridge venture firm Highland Capital Partners. ‘‘We face constraints in land and manpower. We want to take advantage of self-driving technology to overcome such constraints and in particular to introduce new mobility concepts which could bring about transformational improvements to public transport in Singapore,’’ said Pang Kin Keong, Singapore’s permanent secretary for transport and the chairman of its committee on autonomous driving. 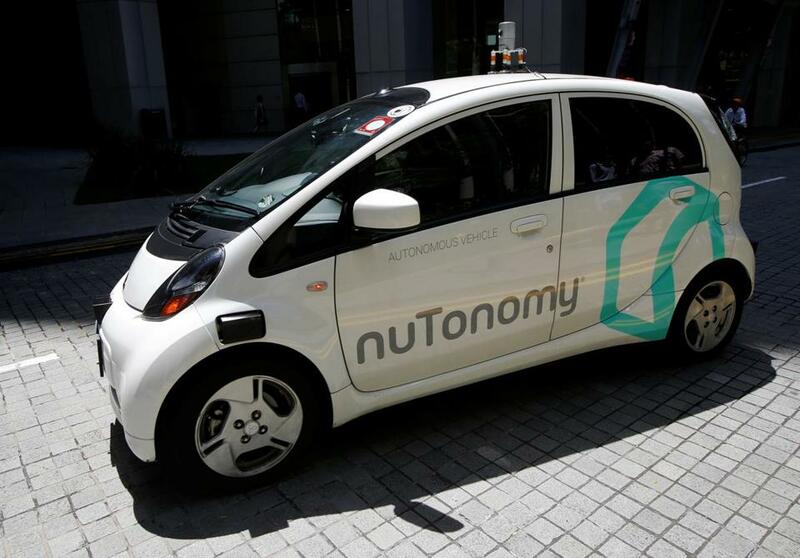 With its Singapore test, nuTonomy is getting a jump on Uber, which has announced it will offer self-driving cars in Pittsburgh by the end of this month. Also earlier this month, Ford Motor Co. said it would begin mass producing self-driving vehicles in 2021, initially for use as taxicabs. And two of the world’s leading makers of automotive components, Delphi Automotive LLP and Mobileye Inc., said earlier this week that they’re moving directly onto nuTonomy’s turf. By 2019, the two companies expect to offer a suite of components and software that carmakers can use to make their cars self-driving. Delphi Corp. was also recently selected to test autonomous vehicles in Singapore and plans to start next year. Hodgson said the test could also boost the fortunes of electric cars. Consumers are reluctant to buy them for fear of running out of juice at a critical time, he said. But a self-driving electric taxi can recharge itself as needed, then immediately get back to work. That could make them ideal for future taxi fleets. NuTonomy was spun out of MIT, where Iagnemma is director of the Robotic Mobility Group at the school and Emilio Frazzoli, the company’s cofounder and chief technology officer, is a professor of aeronautics and astronautics. The pair plan to slowly expand the size of the self-driving fleet, and nuTonomy’s goal is to have a widely available commercial “robo-taxi” service available in the country in 2018.